Sweet Sunnah© Black Seed Herb Inc.
is your online source for truly natural personal care products and nutritional supplements formulated with one of the worlds greatest herbs- Black Seed. ALL OF OUR PRODUCTS QUALIFY FOR FREE SHIPPING BUT YOU MUST SPEND $75USD TO RECEIVE THE FREE SHIPPING. We have an unwavering commitment to creating an extraordinary, unprecedented range of Black Seed Herbal products that are inherently pure and safe while expanding the efficacy and vibrantly healthy benefits of Black Seed body care. BLACK SEED is phytotherapy! It is a wondrous herb that has been used for centuries throughout the world for its many wonderful properties. Our goal is to provide you with a wealth of information, products, and gifts that support and promote well being. We want you to feel comfortable about ordering from us. BLACK SEED and it's herbal virtues stem from the ancient knowledge of Prophetic traditions to new scientific research on the benefits of herbal formulary. This intersection between the Prophetic knowledge base matched with the learning from scientific research surely contributes to making the Sweet Sunnah Black Seed products totally effective and unique. Black Seed (Nigella sativa) appropriately known as the "seed of blessing" is considered to be one of the greatest herbs of all times. This small but incredibly healing herb is known throughout the world by many names such as black cumin, kalonji, blackseed, swartzcummel, Nigella sativa, fennel flower, habbat al barakah, sinouj, black caraway and habba sawdah. It is excellent phytotherapy used for millenniums by people from all over the world. Phytotherapeutic- simply put, consists of the treatment or prevention of ailments and diseases through the usage of plants. Finally, Sweet Sunnah Black Seed Herbals has developed an expertise in two domains, Black Seed therapeutic and herbal treatments, in a lesser proportion, Black Seed natural herbal cosmetics. The development of these lines of products is simply the consequence of answering to the demand from many of our satisfied customers. 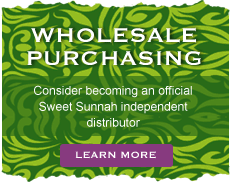 The Sweet Sunnah Loyalty Rewards Program allows you to earn points that can be used for discounts on purchases! Best of all, earning points is easy. .